For this blog posting, I’ll only cover the geosynchronous satellite capabilities. In a future posting I’ll cover the polar orbiting hardware and its capabilities. The beauty of geosynchronous satellites is the simplicity with which they can be tracked. Rather than flitting all about and requiring fancy calculations and equipment to track them, you merely point the dish to a point in the sky where the satellite remains fixed relative to the motion of the earth and pretty much lock the receiving dish down. Since the satellite is moving with a trajectory and speed that matches the rotation of the earth, the satellite is said to be “geo-stationary”. 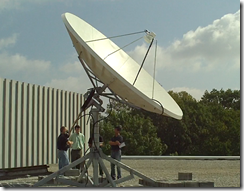 The dish used to receive the signals from the geosynchronous satellites is therefore simple in its design. It is mounted with only one axis of movement, meaning it can only be adjusted along an arc of the sky either to the east or to the west. There is a motor and lead screw mounted on the back that will either push the dish one way, or pull the dish the other in order to position it for the best signal strength. The current intent of the UD dish seems to be dedicated to constantly receiving real-time data from the GOES-EAST satellite (also known as “GOES-13”). GOES East outputs full disk imagery of the the earth from a longitude of 75 degrees west, which gives a good view of pretty much all of North and South America and a good chunk of the Pacific and Atlantic Ocean. 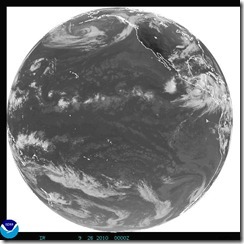 GOES stands for “Geostationary Operational Environmental Satellite” and it is operated by NOAA’s NESDIS or “National Environmental Satellite, Data, and Information Service” primarily to support meteorological operations and research, which includes weather forecasting and storm tracking. 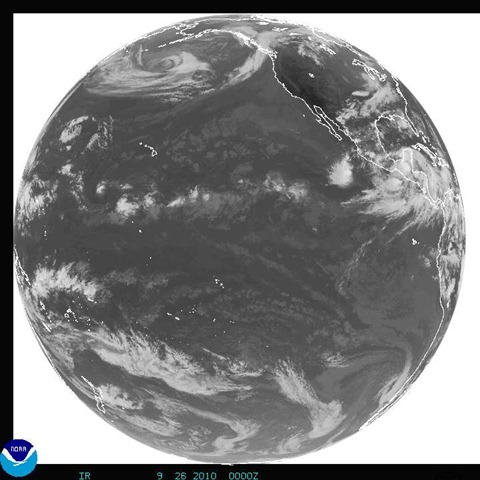 The dish is oriented in such a way that it could also be programmed to point to GOES-WEST (aka GOES-11) for a satellite view of the Pacific Ocean (centered around 135 degrees west longitude) as well if the need arises. 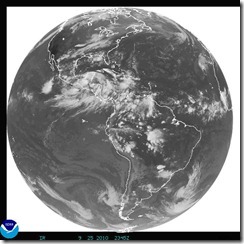 One thing to bear in mind is that GOES-13 hasn’t always been “GOES East” – it took over for GOES-12 in April 2010, with GOES-12 moving to 60 degrees West to replace GOES-10 (decommissioned) for coverage of South America. I note this so that you don’t assume that the sensors (and/or their calibration factors) for a particular GOES station are always the same. The current GOES-East has optical imagers with 6 channels with resolutions of 1.1km for the visible channel (one); and 4km and 8km resolutions for the near infrared, water vapor and thermal infrared channels (two through six). The imager is basically a rotating mirror and lens configuration that scans the earth from north to south, line by line to receive reflected visible light, water vapor as well as infrared radiation channels. Each line scanned is digitized and transmitted back towards the earth with measurement units of percent albedo for visible light and temperature for the water vapor and infrared information. Spectral response functions can now also be downloaded online from the NOAA Office of Satellite Operations as well as other GOES calibration information. GOES satellites are also equipped with a sounder with 8km resolution. The sounder scans the atmosphere over the land and ocean and provides vertical profiles which include the temperature of the surface and cloud tops as well as derived wind velocities from these measurements. 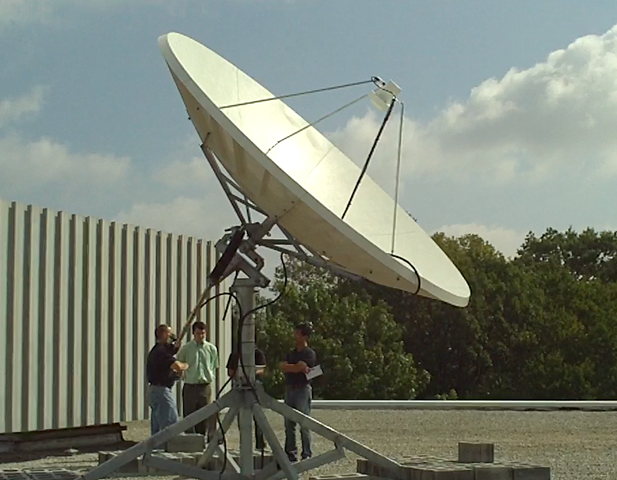 The key feature to having a satellite receiving station on-site is the access to the raw, real-time satellite data. 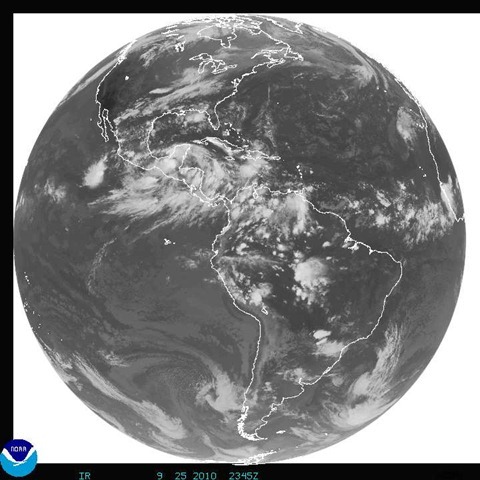 Sure, you can get pull some images down from the NOAA Geostationary Satellite Server, but they would be just derived images. Scientists here at UD and elsewhere are interested in getting the latest raw data feeds from the satellites so that they can research and develop algorithms that process the raw channel data into other products in support of their research projects. Next on my agenda is to try to give some insight into the polar orbiting satellite tracking station and the fancy gear that sits inside the radome enclosure. Cheers!